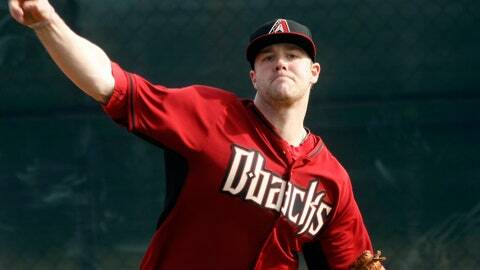 Archie Bradley will start for the Diamondbacks on Friday against Team Australia. SYDNEY — Top prospect Archie Bradley will get the start for the Arizona Diamondbacks against Team Australia in an exhibition game Friday with a potential spot in the starting rotation following a serious injury to Patrick Corbin. Left-hander Corbin was scheduled to pitch the opening game of the MLB season against Clayton Kershaw and the Los Angeles Dodgers on Saturday at Sydney Cricket Ground. But Corbin has a partially torn ligament in his left elbow that may require season-ending surgery. Diamondbacks manager Kirk Gibson said Thursday he had no update on Corbin’s condition, but that the 21-year-old Bradley would pitch "5 (innings) and 75 (pitches) or maybe up to 90" in the Diamondbacks final outing before the weekend series. In Corbin’s absence, left-hander Wade Miley will get the start against Kershaw. When Corbin was injured, Diamondbacks general manager Kevin Towers said there were three "in-house" candidates to join the rotation — Bradley, right-hander Randall Delgado and Josh Collmenter, who normally is the long reliever. Corbin returned this season as the No. 1 starter. Collmenter pitched in a simulated game Thursday during a Diamondbacks workout and was rocked by an opposite-field home run by outfielder Mark Trumbo. Considered among the best pitching prospects in the minors, Bradley was the seventh overall pick in the 2011 draft. He’s 26-11 overall in the minors, has reached Double A and averages more than a strikeout per inning. Before Corbin’s injury, it was likely the Diamondbacks might have started Bradley off in the minors to work on his secondary pitches. Bradley had allowed just three hits without a run in 6 1-3 previous innings this spring, but he only got through two innings against the Seattle Mariners on March 13, allowing four runs on five hits with two walks. "He’s had a couple of good bullpens, but he didn’t have a very good outing last time," Gibson said Thursday. "We’re hoping he’ll go well tomorrow night." Diamondbacks right-hander Trevor Cahill is scheduled to start against Dodgers’ Hyun-Jin Ryu in Sunday’s second and final game.